Yamba is an Aboriginal word for either shellfish or headland. 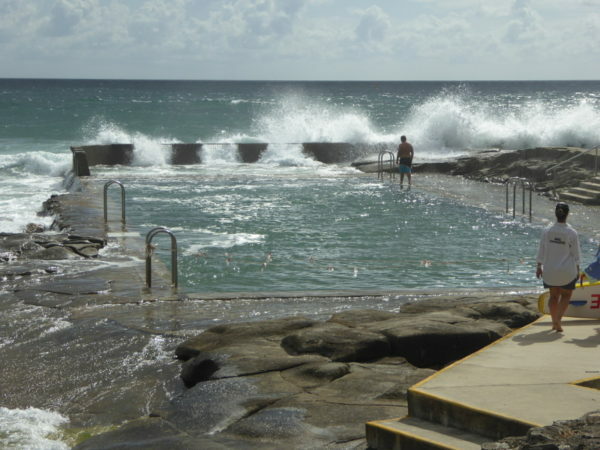 Yamba Ocean Pool is the most northerly of the real ocean baths along the NSW coast. It may well also be the most recently built – constructed in the 1960s – though it may also be the more modern building methods and materials that made it more vulnerable to closure on a regular basis. It was officially closed still on the day we visited in mid-November – locals told me there was a crack in the concrete floor, though it seemed to fill up pretty quickly on the incoming tide as we watched. Another local said the Warning signs were because the pool was too shallow, which it did indeed look when we first arrived. But I decided we had come too far, and I was too close to the end of this quest, not to get into the water at least for a few minutes. Once I had been reassured by yet another local that there were no chemical cleaning products in the pool, and the depth looked fine for swimming to me, I took the plunge and thoroughly enjoyed it. Yamba Rock Pool felt to me like a regular 30m pool, with a drainage area on the ocean side that might have been mistaken for a kids pool if it hadn’t been so deep and so exposed to the incoming waves. The following day we returned to Yamba beach for breakfast and were so glad we did. Ocean pools always look magical in sunshine, and although the surf was up, the Yamba Rock Pool looked scintillating in the morning sun. What’s more, it was high tide, meaning the ocean was running mischievously over the flat rocks that surround the pool and the pool itself was full to the brim. When I saw a bunch of SLSC lifeguards practising their rescues in the pool, and a few other folk defying the ‘pool closed’ signs, we both decided this was an opportunity not to be missed. I plunged in for another few laps, finding the fresh high tide water much cooler, but also more exhilarating than the day before. The sight of us two adults in the water (with lifeguards now moved on, we were alone in the pool) obviously emboldened a couple of young kids, who can’t have been more than 10 or 11 but seemed to relish the excitement of swimming in deep water. The boy clearly fancied a dip in the turbulent waters of the small, ocean end pool, but wanted me in their first to show it was safe: I have to confess, I opted not to – defying the Danger signs was enough for one day, and nobody else seemed to fancy the washing machines experience that that little pool would undoubtedly have been. The pool sits at the southern end of the main beach in Yamba, with views back up the wonderful curve of the bay and up to the lovely old Pacific Hotel at the top of the cliff. It really is a magical spot and surely one of the nicest along the whole NSW coast. In fact we liked Yamba so much, we briefly wondered if we were doing the right thing moving to Victoria next month…. They’re not big on signposting the ocean pools up here in northern NSW. Yamba’s ocean pool was not on any of the local maps, there were no signposts for directions, but I guess if you’re local, you know it’s at the southern end of the main beach. We parked up by the Palace Hotel and walked down the slope past the SLSC building. 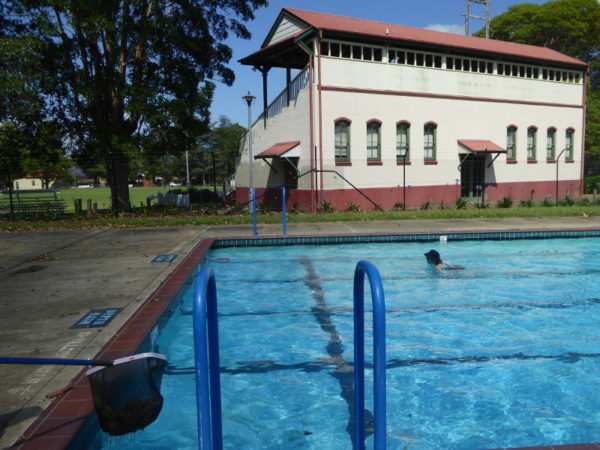 When there are no warning signs and ropes to clamber over, access to the water at Yamba Pool is via the wide stone steps at the shallow end, or vertical metal stairs at the deep end. Try the exit half way up the lap if you like, but it felt like too much of an effort to me, with nothing much to hold onto to haul yourself out here. There are showers back at the toilets up on the slope behind the pool, towards the SLSC building. The showers are built into the wall of the toilets. The toilets have a bench in them but no indoor showers here. It’s hard to say because the pool was officially closed, but around low tide the depth seemed pretty shallow and at high tide the water comes swishing round over the sides of the pool, but only ankle deep so no problem getting in. 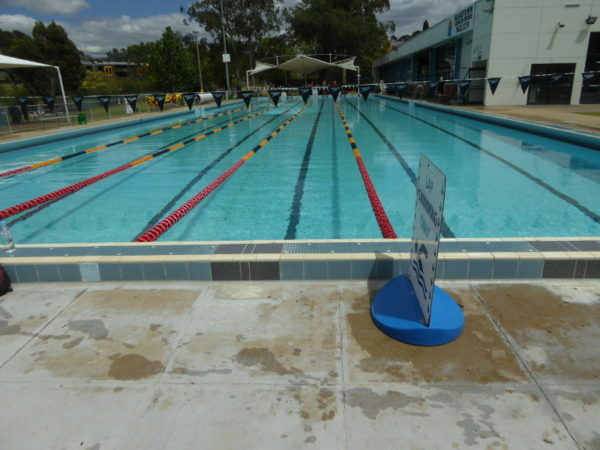 I didn’t find any information online on Yamba Pool so if anybody local can shed any light I’d love to hear from them. No names this time and the people I chatted with were all visitors, except for the SLSC juniors supervisor who told us we wouldn’t be getting in the way of their training in the pool. We connected with the two young kids who were splashing around and enjoying the water, and exchanged a few words with a Canadian visitor who had been brave enough to swim out in the bay the previous day but was opting for a few laps in the rock pool the day we showed up. Good to see my fellow swim blogger Therese had a similar situation to ours, with pool closed signs up but locals in the water anyway! I only found one link to any rcent articles on Yamba. This was from the local newspaper, and talks of the pool being reopened in time for summer 2017. The Kiosk reviewed by the FancyaCuppa website. What a great spot to have a post swim coffee – or tea. The coffee was smooth (from Byron Bay), and the tea was an excellent loose leaf. For a really healthy start to the day, have the fresh fruit salad. After a dip in the ocean baths, you’ll almost certainly feel fit and at one with the world. Thanks Jeremy. Yes, I did mean Pacific Hotel (change made). I will certainly be back – we loved Yamba and we also want to swim in the Angourie Blue Pool, though I don’t think that is salt water, is it? Great. Thanks for the tips, Caitlin. How do you tell if the algae in a pool is dangerous or not? how even do you know if there is algae there?? There’s generally a sign up if there’s an outbreak, and they have sprinklers going to prevent the stagnation. We chose Yamba as our place to stop for a night due in part to the expectation of having a morning swim in the salt water pool. However was very disappointed and saddened to see the state of it ( despite the “Pool Open” sign being posted). It was murky green smelly water with thousands of tiny fish. The metal grate splash bars were completely clogged with rotting seaweed, the fill- pool at the end also had large volumes of seaweed and the water exchange inlets also fully clogged up. How frustrating. Yamba pool was odd for us, too. Signs up everywhere saying it was closed but the water seemed lovely so we got in anyway, and were in there with a lifeguard training someone too, so all was fine. 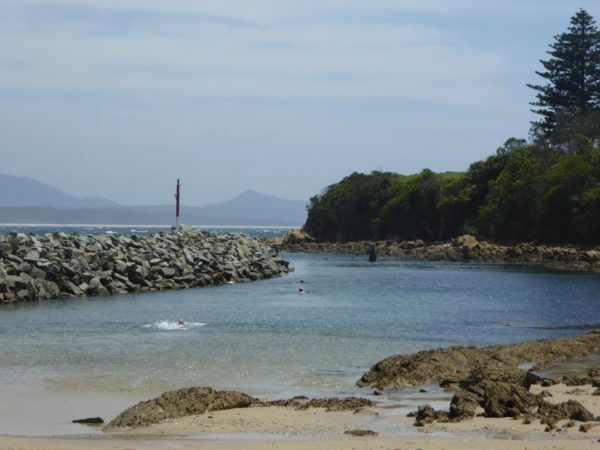 What a shame it hadn’t been cleared when you go there; that happened to us on our last visit to my favourite ocean pool in the Illawarra – doesn’t mean I don’t like it anymore, but sometimes conditions just mean the pool isn’t what it could be.